Overview of Atlanta commercial office space by boxer property, it is vibrant metropolitan area fed by major universities and a great business climate. Downtown Atlanta is the oldest section of the city and has increasingly grown into the brand that defines Atlanta and even the state. New and relocating businesses, as well some of the youngest demographics in the country, are drawn here for work and play. Downtown Atlanta is easily one of the most culturally important cities in the United States, vibrant, growing and flush with professional and personal opportunity. Atlanta is the capital of Georgia and its most populous city. It has grown to become one of the most culturally important cities in the United States. The city has a vibrant metropolitan area fed by major universities and a great business climate. Ranked the third best city for its business climate, Downtown Atlanta is an attractive location for business. Over the last decade, the region has attracted and grown a broad range of heavy hitters. It’s been the long-term host for corporations like Turner Broadcasting, home of TBS, TNT, TMC, Cartoon Network and Boomerang. The area is also home to a variety of Fulton County and Atlanta government offices, including the Federal Reserve. The cost of living here has always been low, but after decades of a steady calm, the idea of living here has skyrocketed. The population has jumped consistently for years in the district and its surrounding neighborhoods, particularly with young professionals looking to have quick access to their places of work. Atlanta has a number of great universities and colleges to find bright, young talent to recruit for your company. If you’re an entrepreneur, you can find students and young business owners to bounce ideas off also. 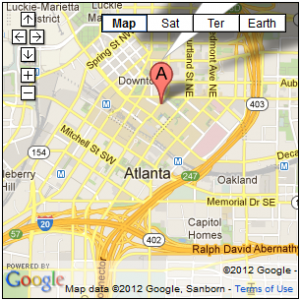 Downtown Atlanta is approximately seven miles from Hartsfield-Jackson Atlanta International Airport. Interstate 75/85 passes right through the city, allowing for convenient access to much of the downtown area. I-20 provides access to prominent neighborhoods outside Downtown. You can also get around the area via the city’s public transport (MARTA) bus and train system. A major station is Five Points where the East-West and North-South lines intersect. Other significant stations include Peachtree Center, Georgia State and Civic Center. MARTA commuter rail stretches in all cardinal directions from Downtown Atlanta out to the Suburbs. Looking for something to fun and exciting to do in Atlanta? There are a number of pastimes you can enjoy nearby. They are home to major sports franchises such as the Atlanta Braves, Hawks and Falcons. If you’re looking for something more interactive, you can bring clients and family to visit nearby landmarks such as the Atlanta Zoo or Museum of High Arts. Atlanta has a booming entertainment industry, including art, music, sports and recreation. Centennial Olympic Park has an ice skating rink (winter) and free concerts (summer). Fountains are shaped like the Olympic Rings and is a favored play area for kids. Within walking distance of the park is the Georgia Aquarium, the CNN Center and the Phillips Arena. Underground Atlanta is a shopping and entertainment hub that’s completely underground. It’s active during the day and is known for partying and clubbing at night. There’s also Six Flags Over Georgia, the Rialto Center for the Arts on Forsyth Street, College Football Hall of Fame and the Georgia Aquarium. The sports fan will be in good company. Atlanta has the Braves at Turner Field, the Falcons calling the Georgia Dome home and the Hawks at the Phillips Arena.